In terms of electrification, the country can be divided into grid and off-grid areas. Since independence, the level of electrification has been low in areas traditionally regarded as off-grid compared to areas where the grid network exists. Indeed, electrification in the country seemed to follow the railway line cutting across the country from Mombasa to Nairobi and in areas where most of the economic activities took place. Areas that have been far from the railway line such as Turkana, Marsabit, Mandera, Wajir, Garissa and Lamu counties came to be considered off-grid although the grid finally reached Garissa and Lamu counties in 2016. 110km of 66KV line from Turkwell to Lokichar through Kalimungorok. 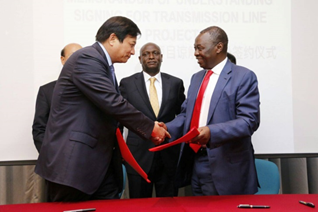 The project comprises a 66kV line from the 220kV/66kV substation at Turkwel power station. The total length of the line is 110km along the road to Lodwar through Kainuk town, Kaputir, Kalemungorok town to Lokichar. 23MVA 66/33kV substation at Lokichar Town. Supplying all public amenities, shops and homesteads within Lokichar town. 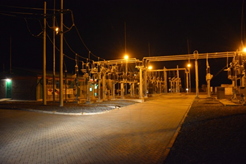 10MVA 66/33kV substation at Kalemungorok Town. Supplying all public amenities, shops and homesteads within Kalemungorok market, Kaplong Market, Katilu and Lopur Markets. 33KV distribution network at Kalimungorok town and nearby markets and public utilities. Supplying all public amenities, shops and households within Kakong market and Kaputir Market. Moving to the future, REA will now concentrate on electrifying off-grid areas through renewable energy generation for purposes of harnessing solar energy resource in the off-grid areas and also due to the high operation and maintenance costs associated with diesel power stations. This will be through implementation of solar plants and solar mini-grids for towns. Currently a 55MW solar power plant is being implemented in Garissa at a total cost of Kshs. 13.8 billion. This solar plant will be the biggest in east and central Africa and electricity generated will be fed to the National grid. REA will also power off-grid towns through solar minigrids. To this end, REA has implemented a pilot mini-grid at Biyamadhow in Wajir South Constituency that will serve up to 200 homes in the town. The mini-grid comprises of a 60kVA solar unit with a 40kVA diesel backup to ensure uninterrupted power supply to the residents. 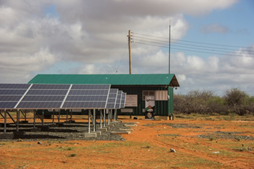 Plans are underway to install twenty five (25) similar solar/diesel systems in the five off-grid counties of Wajir, Mandera, Marsabit, Turkana and Garissa. Solar mini-grid project at Biyamadhow town in Wajir South Constituency.